This booklet describes the new partnerships which are to be established. 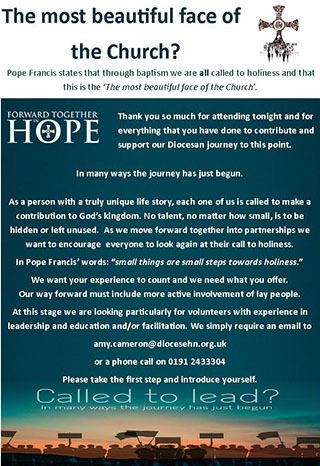 A partnership is a group of parishes agreeing to work together to share resources. 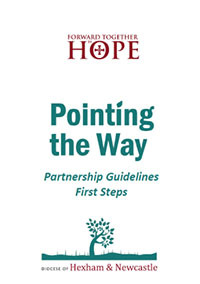 This 'First Steps' guide provides some initial ideas and direction that may be helpful to partnerships. A summary of the other key areas discussed at the January meeting of the Diocesan Board of Trustees. The Partnership Prayer issued for Pentecost 4 June 2017. Pointing the Way leaflet provides a brief update on the formation of the new partnerships and the establishment of Partnership Deans and Development Group. It also includes a summary of the two main documents available. As we move forward together in partnerships, Amy Cameron calls for volunteers with experience of leadership and education.